Cereal is a really fast and easy breakfast, but definitely not the most exciting, so on the weekends we like to make more elaborate fare. 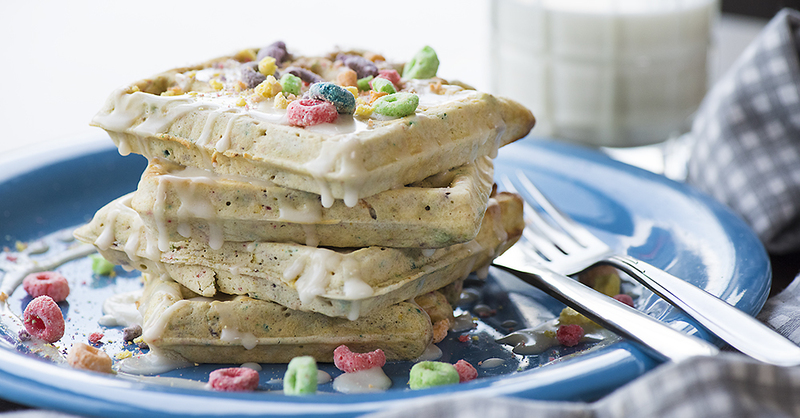 We got to experimenting in the kitchen the other day and came up with a cereal and milk creation like we’d never had before: waffles loaded up with crushed fruit loops, one of the most popular cereals in our household! They’re so bright and cheery – the crumbled cereal looks like rainbow sprinkles are in the batter, but they taste way better! We even like to sprinkle a few extra loops on top for a little extra crunch. We top ours with a sweet milk glaze instead of syrup to complete the theme, but whatever you slather on these babies, they’re gonna taste amazing! Preheat oven to 200ºF and place a baking sheet inside (you will use this to keep waffles warm until all batter is cooked). Preheat waffle iron according to manufacturer instructions, and lightly grease with non-stick spray. In a large bowl, beat together eggs, milk and butter, then gently add dry ingredients until just combined (do not overmix!). Fold in cereal crumbs. Pour 1 cup batter on griddle, close, and cook until golden, 4-5 minutes. When waffle is done, place on cookie sheet in oven to keep warm. Continue with remaining batter. For the glaze, whisk together milk, powdered sugar, and vanilla until smooth. Add more milk if too thick, or more powdered sugar if too thin. Serve waffles warm with glaze, and enjoy!